Concentrated general purpose cleaner & degreaser that quickly penetrates and dissolves grease, oils and dirt. Contains no hazardous ingredients. Biodegradable. Great for all your cleaning applications. is oven and grill cleaner is formulated to loosen tough, burned-on grease from oven, stove tops and deep fryers. A highly alkaline product that is designed to quickly emulsify those tough soils. Heavy duty cleaner/degreaser that is concentrated and biodegradable. This specially formulated product does not contain hazardous ingredients and is non-toxic. Designed for use on floors,walls and as a general purpose cleaner. This ready-to-use cleaner powers through grease and grime on all water fast surfaces. It is easy and safe to use and has a pleasant citrus scent. A cleaner and deodorant formulated with pine oil. Use as a general cleaner or for use on heavily soiled areas. Leaves a pleasant scent and is safe for use on all surfaces not affected by water. Great for use on floors, walls, restroom fixtures and trash containers. A neutral disinfectant product that cleans and deodorizes in one labor saving step. Perfect restroom cleaner for use on walls, floors, shower stalls, stainless steel, sinks and bathtubs. Also, will inhibit the growth of mold and mildew. Lemon scent. A concentrated disinfectant, sanitizer and deodorizer that is formulated for use on hard surfaces such as floors, walls, metal surfaces, stainless steel, plastic surfaces. Also effective against mold and mildew. FDA registered. This EPA registered product is a ready-to-use food contact surface sanitizer. Kills 99.999% of bacteria in 60 seconds and requires no mixing prior to use. Sani-Kleen sanitizes previously cleaned and rinsed, non-porous food contact surfaces. Eliminates odor caused by bacteria. This no-rinse enzyme floor cleaner effectively deep cleans by removing grease and grime soils found in pores in cracks of floor surfaces. Eliminates the need for rinsing after mopping. A ready-to-use window & glass cleaner that leaves no film and is streak-free. A specialty blend of surfactants that break down dirts, oils and grease and leave a streak-free surface. Does not contain ammonia. Enzyme digester that works naturally to break down grease and waste in pipes and grease traps. Safe and will not harm pipes or joints. Neutralizes the odors by destroying odor source. Borizyme is a bacteria formulation that consumes organic material in drains where greases, fats, carbohydrates, proteins and oils amass. This product will help to eliminate the settling of food particles and grease deposits eliminating breeding for fruit flies. Heavy duty non-chlorinated liquid dish machine detergent that has been formulated for use in low temperature machines. Removes tough greasy soils from dishes. Excellent cleaning over a wide range of operating conditions. Not metal-safe. Sodium hypochlorite based sanitizer solution for use in dairy, food processing and food service industries. Ensures sanitation of dishware when injected into the final water rinse. Designed for use with low temp warewashmachines. is concentrated rinse aid that is non-foaming and designed to ensure superior sheeting and drying of dishware and utensils. 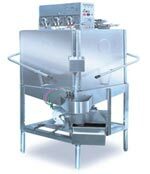 Non-chlorinated, non-foaming dish machine rinse aid formulated for use in high temperature machines. Delivers superior swater sheeting for spot free drying. A concentrated liquid detergent formulated for the presoaking of tableware prior to machine washing. Breaks down stubborn food residues from silverware, utensils and dishes. A liquid formulated to quickly penetrate and break down lime and mineral deposits foundi n low and high temp machines. 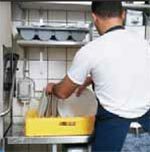 Designed for use on food service equipment such as coffee urns, food preparation equipment. Powdered dish machine detergent that quickly removes stubborn food soils, oils, protein and food stains. Contains highly effective ingredients th at fight stubborn food soils. Specially formulated for manual washing of soiled kitchen items and for use in 3-sink systems. Quickly penetrates and emulsifes baked-on grease and food. Superior foam rentention. A disinfectant, sanitizer and deodorizer used in the sanitization of food contact surfaces, glassware, silverware, dishes, cooking utensils and equipment. Also used as a final rinse aid sanitizer in a three compartment sink. EPA registered.